The Mask Slot is here! This famous 1994 comedy starring Jim Carrey has had us all roaring in laughter. Lines like “Sssomebody stop me!” and “Ssssssssssssssssssmokin!” are still quoted and that big green face is recognised by most people that haven’t been living in a cave. 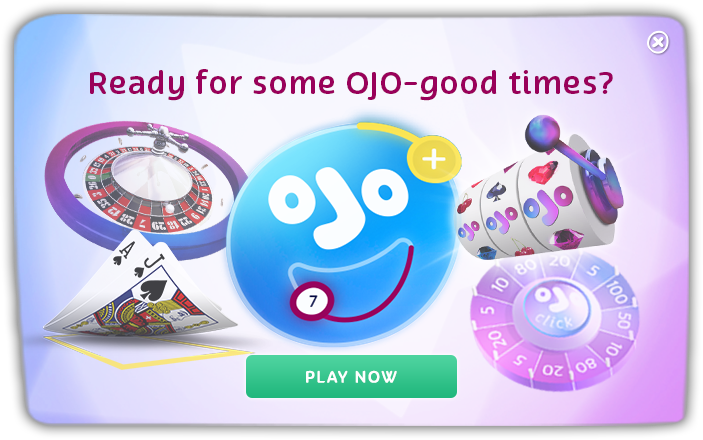 So you can only imagine OJO’s excitement when he found out that The Mask Slot game was coming to PlayOJO! A NextGen Gaming slot created in co-operation with Warner Bros, The Mask Slot game has 5 reels, 20 paylines and comes with 4 randomly triggered wild features as well as free spins where you can get multipliers up to 5x when a wild is part of a win. There’s up to 30,000 times your stake to be won on every free spin! Symbols on the reels include colourful A, K, Q, J and 10 playing cards as well as The Mask’s hat, Milo the dog and money bags. You’ll also see characters Stanley (played by Jim Carrey), Tina (played by Cameron Diaz) and The Mask himself. The Free Games Bonus feature is played when you get 3, 4 or 5 bonus scatters (the entrance to the Coco Bongo nightclub) land anywhere on the reels, giving you 10, 15 or 25 free spins. Alarm Block feature – The Alarm Clock bounces around the reels and if the Hammer destroys it, a 2×2 wild block appears in its place. In A Spin feature – The Mask whirlwind can randomly turn all Tina, Milo, Moneybags, Hat, A, K, Q, KJ and 10 symbols into wilds on certain reels. You can get wilds on up to 3 reels. By The Horn feature – The Mask appears and toots the Horn which turns selected symbols into wilds. Mask Unmask feature – Milo appears and places a Mask over a random 3×3 section on the reel set. All Stanley symbols covered by Mask become wild. You are going to frickin’ love The Mask Slot amigos! WARNING: It’s so good that it might turn your face green. Ooh, somebody stop me! Play The Mask Slot today!